The synchronizing procedure involves hooking your Droid Bionic to a computer and then swapping information back and forth. This process can be done automatically by using special software, or it can be done manually. The manual method isn’t pleasant, though oftentimes it’s necessary. One of the most popular ways to move information between your Android phone and a computer is to use the third-party utility doubleTwist. This amazing program is free, and it’s available at the doubleTwist website. doubleTwist isn’t an Android app. You use it on your computer, either a PC or a Macintosh. The app lets you easily synchronize pictures, music, videos, and web page subscriptions between your computer and its media libraries and any portable device, such as the Droid Bionic. Additionally, doubleTwist gives you the ability to search the Android Market and obtain new apps for your phone. To use doubleTwist, connect your phone to your computer. Choose either the USB Mass Storage or Windows Media Sync option; the MicroSD card is added to your computer’s storage system as a USB mass storage device. Start up the doubleTwist program if it doesn’t start by itself. The simple doubleTwist interface is illustrated in this figure. One easy way to use doubleTwist is to drag and drop media either from your computer to the Droid Bionic or the other way around. Use the program’s interface to browse for media, as shown in the figure. 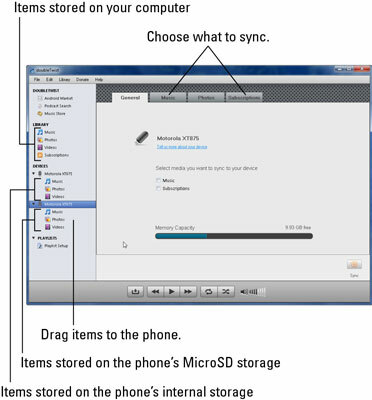 If you choose the Windows Media Sync option, only the Droid Bionic’s MicroSD card is available in doubleTwist. When you choose the Mass Storage USB connection option, you see both the internal and MicroSD storage areas available on the Droid Bionic, as shown in the figure. You cannot copy media purchased at the iTunes store from the Mac to the Droid Bionic. Apparently, you need to upgrade to iTunes Plus before the operation is allowed. doubleTwist doesn’t synchronize contact information. The Droid Bionic automatically synchronizes your phone’s Contacts list with Google. Subscriptions are podcasts or RSS feeds or other types of updated Internet content that can be delivered automatically to your computer.